Amsterdam. 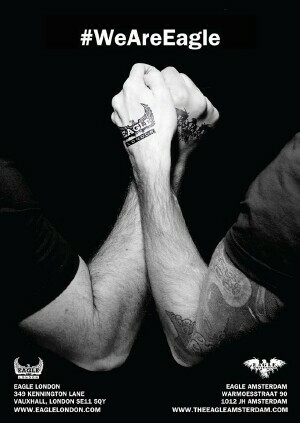 A partnership between Eagle Amsterdam and Eagle London, fully supporting each other’s events, these include Amsterdam Bear Pride, Fetish Week, Damage, Amsterdam Fetish Pride and London Bearfest. There will be a venue swap in London Eagle and will feature Amsterdam street scenes with a red light district, cafe with Dutch street food and the Eagle Amsterdam bar staff coming to take over London. Eagle London we'll be taking our club nights to Amsterdam the super-hot R18, Eagle Bears (London biggest all-bear party) and of course the fresh all-Man Friday night party: Men Inc.
London: Flying high since 2004, Eagle London is a gay bar and club located in the heart of Vauxhall Village, just south of the river Thames, boasting some of London’s best club brands. From men-only cruise sessions to rocking party nights, their calendar is always bursting with fun. Eagle London stands proudly as the most eclectic and inclusive venue gay London has to offer, whether it’s meeting stars, dancing with house divas or simply drinking with your mates, the choice is yours. Home to weekly favourites Men Inc. (Fridays) and the international fabulousness that is Horse Meat Disco (Sundays), they also offer four days of Cruise Control (Monday to Thursday) and a rotating Saturday line up of brilliant parties, from the R18 to Unrestricted and pop-tastic dance floor of Carpet Burn, Eagle Bears is bringing something very hairy to the Eagle London every 2nd Saturday, There really is something for everyone. Amsterdam:For Over 35 years Eagle Amsterdam is the oldest and most famous casual and leather-denim bar, very cruisy and strictly men only. 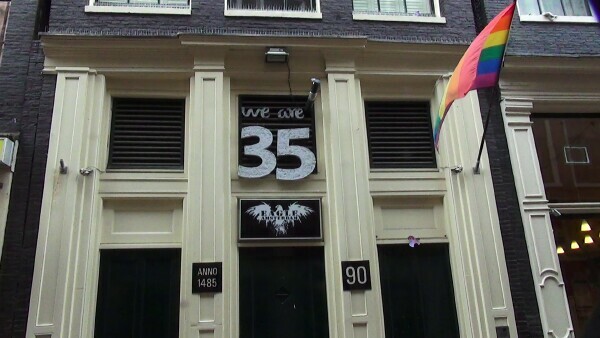 Sited at Warmoesstraat 90, in the Castro of Amsterdam, The Eagle Amsterdam is the most visited men’s bar in town and the most famous gay venue of Amsterdam. Although this area is traditionally associated with leather-and-denim, the Eagle attracts all types of gays. Men love to come to this place because of the fun options it provides. The location consists of three floors: the bar is on the ground floor, on the second floor there is a communal cruising area with a picnic table to try out all your gym-stands. Equipped with dance floor with hard-core house music, alongside amazing laser lights for the circuit boys. There is a lounge as well a smoking lounge where one can sit and have a chat.